Hannover 96 vs Bayern Munich Live Streaming Info: BPL 2015 Live Score; Match Preview – 19th December: It is the German Bundesliga and today we have Hannover 96 hosting the mighty Bayern Munich at the HDI-Arena. The Bundesliga, this time is very competitive as the race for the top spot is still open as Borussia Dortmund are just five points below Bayern Munich. Munich are at the No. 1 with 43 points in the 16 matches, above Dortmund by 5 points. Hannover 96 have been struggling this season as they are currently in the relegation zone with only 14by 5 points. Hannover 96 have been struggling this season as they are currently in the relegation zone with only 14 points on the table in their 16 matches, below Frankfurt by one point and above Hoffenheim by one point. They need to work very hard if they want to avoid relegation and live to see another season at the top tier. FC Bayern was in group F of the Champions league group stage with Arsenal, Olympiakos and Dinamo Zagreb. They finished first with 15 points in the 6 games, Arsenal finished second and Olympiakos third. They qualified for the round of 16 of the Champions League and got Juventus as their opponents for the fixture. It will be a very interesting match as both the teams are very strong but Juventus’s form this season haven’t been up to the mark and they will need to work very hard if they want to beat Bayern Munich. They played Darmstadt 98 in the DFB Pokal on 16th of December and won by 1-0 as Xabi Alonso scored in the 40th minute and moved ahead in the cup. They have won four and lost once in the last five matches played in the league. They lost to B’ Mgladbach by 3-1 in an away match. They played FC Ingolstadt in their last league game and won easily by 2-0. Lewandowski scored the first goal in the 65th minute and then Lahm made it 2-0 for Munich in the 75th minute and they won the game with ease. Hannover 96 are having a very bad season and they are the ones to blame. They haven’t played their best football and are now struggling for survival in the league. They have lost four and won one in their last five games in the league. They played against Hoffenheim in their last league tie and lost by 1-0 away from home. Jonathan Schmid’s first half goal was enough for Hoffenheim to register their win against Hannover 96. Munich have the better team and form to win this one very easily. Stay tuned for more news. 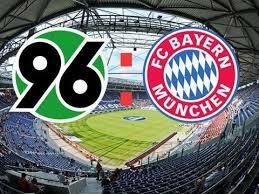 We will update you with every news from Hannover 96 vs Bayern Munich match today.